1446 colville Road, RD4, coromandel. Anglers Lodge is now available as your magical wedding venue, a stunning setting perfect for your ceremony & reception. The natural Coromandel backdrop is perfect for a rustic, vintage or bohemian themed wedding. Anglers is suited for functions with 40-60 guests, everyone can stay on-site turning your wedding day into a wedding get away for your nearest and dearest. Anglers accommodation consists of The Penthouse, Studio 12, Cabins and Self-contained units of various sizes. Please let us know if you are planning a bigger or smaller wedding and we will put together a bespoke wedding package perfect for you. 21 Shaw Road, Waihi Beach. Flatwhite is an all new, absolute beachfront wedding venue at gorgeous Waihi Beach. Seating up to 80 people, our venue provides stunning views across the ocean to Mayor Island and Mt Manganui. We are a fully licensed and full catering, ceremony and reception venue providing the perfect location for a perfect day. With an experienced coordinator on hand to help plan your day and a dediated service team, your guests will be well looked after. We have transformed the inside of the Mercury Bay Aero Club hangar so that you can enjoy a wedding reception or party that is something, 'little bit different'. We have a nice big space and can cater for up to 180 seated dinner guests, and the band! We are specialists in creating an awesome atmosphere and wickedly delicious foods to suit you and your event. Hush Intimate Weddings are a total romance package with the wedding venue and accommodation at Hush Boutique Accommodation for anywhere from an elopement up to twenty people. Hush is in Coromandel Town, 2.5 hours from Auckland, and is a stunning, peaceful and rustic-chic venue. Nestled amongst the lovely NZ bush, with abundant bird life and a bubbling stream. Hush also offers a wedding planning service for couples seeking a destination wedding. Mercury Bay Estate can fulfil all venue requirements for up to 200 seated guests. The picturesque 5 acre property has funny signs and scenes throughout, and is complete with giftshop, playground, and function centre for weddings and other occasions. The wheelchair friendly path through the gardens will take you over bridges, past water lily ponds, waterfalls, waterwheels and magical fountains. You will be kept entertained by our friendly hand fed birds and fish, plus our fascinating turtles, said to be the oldest in New Zealand. Stone Terrace sits overlooking the beautiful white sands of the iconic Hot Water Beach on the eastern coast of the Coromandel Peninsula in New Zealand. Whether you’re looking to enjoy a peaceful weekend getaway on the beach or wishing to create a memorable wedding event, Stone Terrace offers beauty, elegance, and privacy. 1299 Port Charles Road, Port Charles. Nestled below beautiful Moehau Mountain, on the magestic Coromandel peninsula is where you will find Tangiaro Kiwi Retreat. 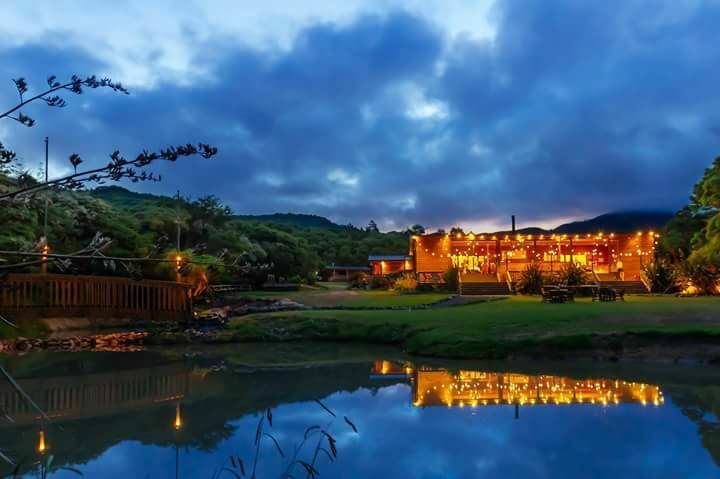 Situated amongst beautiful native New Zealand bush with the Tangiaro stream flowing through it, Tangiaro Kiwi Retreat has stylish, well appointed cedar chalets and a restaurant/café/bar. The perfect place to hold functions, especially weddings. 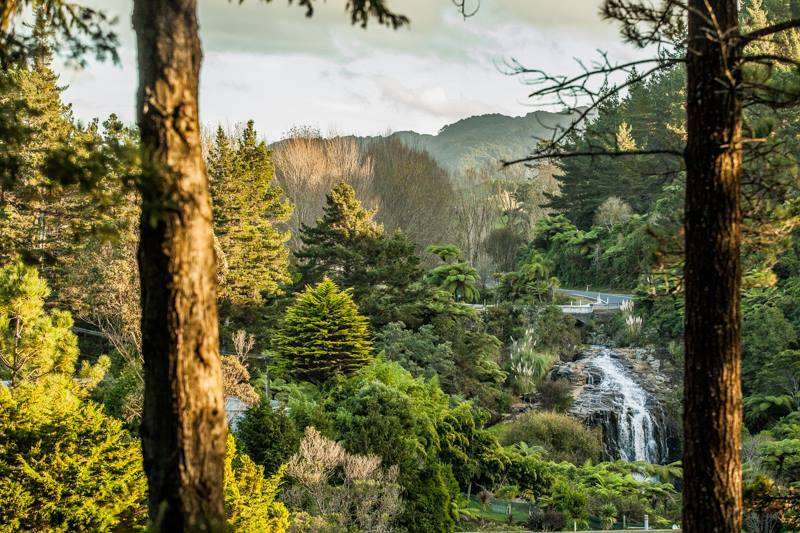 A few minutes’ drive away from some of the most breathtaking beaches in New Zealand, Tangiaro Kiwi Retreat is THE place to go to if all you wish to hear is the sound of birds & the breeze through the trees. Our alpine style chalets blend beautifully into the natural surroundings and make you feel as if you are a part of the bush. Fully appointed and designed with comfort in mind, your chalet will help you relax into your visit. 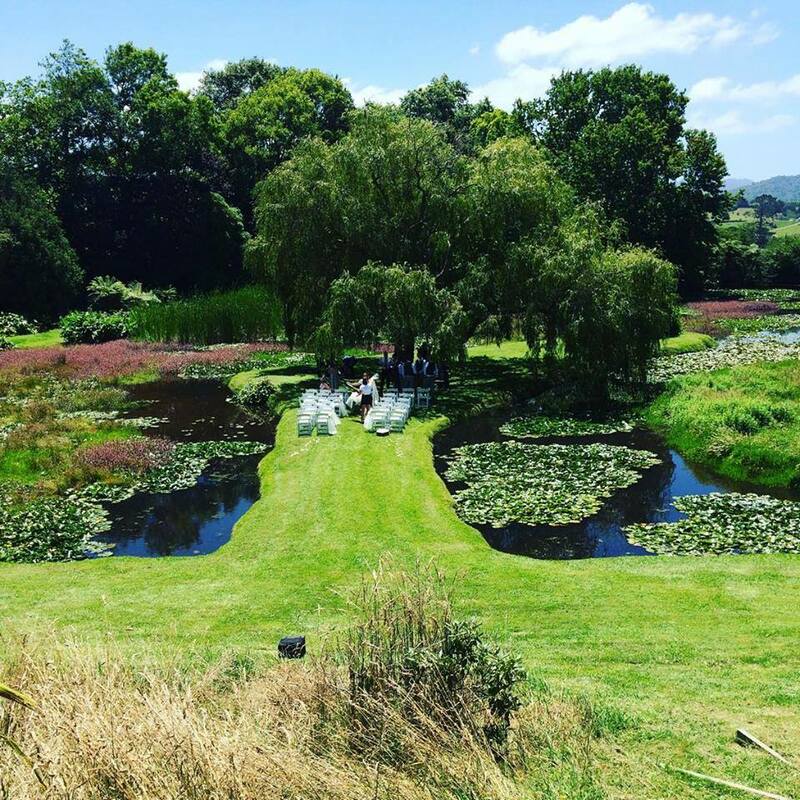 Fifteen Enchanting Acres of Water Gardens & Park-like Grounds in which to Celebrate the Perfect Wedding! A photographer's Dream Setting! Luxury Garden Cottages, On-site, Offer a Delightful Finale to an Unforgettable Experience.